A short course in geopolitics can be read in a nighttime satellite image of the Korean Peninsula. The south is a land ablaze with light from scores of vibrant urban centers culminating with the radiant metropolis of Seoul. 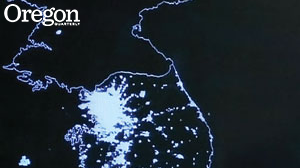 The north is essentially dark, a black expanse with just a pinprick of light marking North Korea's capital, Pyongyang. With outside access controlled to an extreme degree, even basic knowledge about the Democratic People's Republic of Korea (DPRK) is sketchy. For decades, reports of mass starvation, Orwellian mind control of the populace, nuclear arms development, and the ruling family dynasty have been cobbled together from mere scraps of information. This July, University of Oregon sociology professor Patricia Gwartney had the rare opportunity to form her own firsthand impressions of the mysterious nation. "It was amazing," she says, "though I still don't know how to interpret so much of what I saw." Gwartney, who has worked at the UO since 1981, was the founding director of the now-defunct Oregon Survey Research Laboratory. This summer, under the auspices of Statistics Without Borders, she taught courses at the inaugural Pyongyang Summer Institute in Survey Science and Quantitative Methodology (PSI). A primary goal of PSI is to teach Koreans skills they can use when applying for international grants and aid to help improve their struggling country. The old Russian-built Air Koryo plane she boarded for the flight from Beijing to Pyongyang had open luggage racks instead of bins and no air conditioning. "We sat on the runway for 45 sweltering minutes." Flight attendants handed out fans and glossy magazines that trumpeted the glories of the motherland, its outstanding care for its people, and its leadership status in world affairs. One passenger collapsed from heat exhaustion. Upon landing in Pyongyang, Gwartney saw a surprising number of Mercedes-Benz and other cars at the tiny, bare-bones airport. This didn't square with books she'd read, which said motorized vehicles are extremely rare in the DPRK. She began to suspect the cars might be "plants," Potemkin vehicles intended to impress the arriving foreigners. When she boarded a bus that traveled along a broad, well-paved road with virtually no cars on it, she wondered aloud if it, too, might be mostly for show. Her "minder" (any time PSI members were "a foot off campus" they were accompanied by friendly but vigilant government minders) emphatically rejected this suggestion. The minder also forbade taking photos from the bus. What she didn't photograph was a huge number of people walking—people who she thought looked darkly tanned and sweaty with zoned-out eyes. Wooden carts pulled by oxen or by people. Some broken down electric trams, possibly from the 1950s and so overcrowded people were almost falling out. 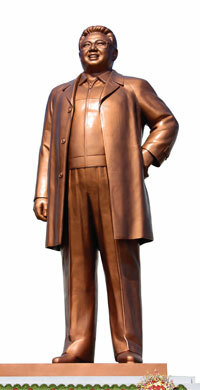 PSI is located at Pyongyang University of Science and Technology (PUST, rhymes with roost), the first and only private university in North Korea. Funded largely by South Korean Christian churches, it began offering courses in October 2010. Arriving there, she noticed "there was no fence, or clear demarcation of the campus, but we were absolutely not to leave the grounds." Movement was always strictly limited, Gwartney recalls. Once, on an excursion, she wandered away from her minders, attracted by an inviting brook. They couldn't regain control over the meandering American until they warned—truthfully or not—that there were land mines along the creek bed. The newly constructed PUST campus suffered from shoddy construction, she says, "with cracks everywhere and unreliable plumbing." The 25 to 30 summer faculty members were international volunteers; their room and board was provided. Gwartney knew she was expected to bring her own bedding and towels to stock her dorm room, and she did, but she wasn't expecting to sleep on a box spring. The room had one sad sagging desk and no chairs. "Mosquitos buzzed in and out of the bathtub drain," though the room had no hot water—a hot shower was a hallway and flight of stairs away. In a uniquely North Korean twist, the university was run by a regular administration along with a parallel administration, agents of the central government—the counterparts. For example, the university had a president and the government had its own counterpart university president. Among their duties, which remained mostly mysterious to Gwartney and her colleagues, the counterparts apparently grilled students about any interaction with Caucasians (as all foreigners were called). When she offered students candy they wouldn't take it, preferring to avoid scrutiny from the counterparts. The all-male student body of 200 undergraduate and about 50 graduate students, she was told repeatedly, ranked academically in the top 1 to 2 percent of North Korean collegians. All students wore black slacks and white shirts with neckties to classes. "They show their individuality in their ties," she says. "Very bright colors." Instructors conducted all PSI classes in English and all students spoke the language (in varying degrees of proficiency). When Gwartney entered her classroom the students leapt up and enthusiastically called out, "Good morning, Professor!" "They were beautiful young men," she says. "I thought of them as Peter Pans, stuck in a bubble." And stuck—quite literally—they were. School officials allowed students two visits home each year, even though nearly all were from Pyongyang. Higher education in the DPRK? Simple tasks such as getting materials photocopied required great diplomacy and effort. She was promised books for her students and teaching assistants to help with her classes . . . but they never materialized. Electrical power, intermittent at first, became less dependable as Gwartney's stay progressed, sometimes going down for minutes, sometimes hours. Her classroom was monitored with microphones. Student performance "ran the gamut." Most of her undergraduates had previously studied statistics, but the "brazen and rampant" cheating made it difficult to accurately judge their abilities. Though she was told her grad students would have Internet access, she questioned this assertion since not one of them completed the Internet-required homework. She describes her students as "prudish about sexuality." The all-male PUST students were guarded by a detachment of 100 female soldiers. When she asked about secret romances, her students were vehement—absolutely not! (Gwartney questions what exactly the soldiers were protecting the campus from. The fact that PUST is required to billet and feed its protectors, she posits, may explain this staggering level of security.) She also surveyed her students on their opinions about allowing women to attend the university. Nearly all were against the idea—coed classes would be a major distraction. Another question arose from the students' behavior. They would crowd their desks in the front of the classroom, bunching together, "draping their arms around each other" and at times "casually stroking one another's ears." Such unexpected displays spurred Gwartney to ask about homosexuality among students. They responded that they had heard of such stuff in America, but surely not on their campus. She and her colleagues ate "colorless, repetitive" food in the dining hall: lots of rice, tofu, soups, kimchi, and flavored vegetable protein. No fresh vegetables, salt, pepper, sugar, or soy sauce. She had one peach in four weeks. Professors and grad students ate better than undergraduates. Her food options were less dismal in the markets of the capital's embassy district, which sold otherwise hard-to-find items including peanut butter, jelly, oranges, canned goods, and lots and lots of alcohol. "A big jar of Nutella saved my life," she recalls with a chuckle. While Gwartney's students appeared unaware of the country's poverty, crumbling Soviet-era infrastructure, and utter lack of many freedoms, they wholeheartedly believe "they live in the best country in world, the most beautiful city, the cleanest city, et cetera." Nevertheless, she sees cracks forming in the DPRK's isolationist policies. The counterpart university vice president seemed genuinely to value and welcome foreign instructors. Gwartney was permitted to teach whatever she wanted and she used that freedom to show her grad students datasets that ranked (unflatteringly) their homeland alongside other countries in health, education, and economic development. Perhaps most optimistic of all, in one anonymous survey of her students, Gwartney left space on the form for "other comments." In the blank, one respondent wrote, "I really want to travel."